The construction industry is compiled of endless tasks. The question becomes who will complete these tasks… Who will build? As designers and contractors we should seek craft and not labor. We not only ask the question ‘Who will build?’, but ‘Who will take pride in what they build?’ When designing and drawing here at Studio MEJA, we always question how our designs are built. A craftsman is defined as one who creates or performs with skill or dexterity. He or she has experience, takes care in what they do, and understands detail. Our contractors renovating our new office are easily situated in these areas of craft. We work side by side with them, understand any issues, and develop the best possible solution. A craftsman’s best work is completed with full understanding. It's always exciting to see the foundations of a project materialize from the ground. While the rest of this building is a retrofit of an existing warehouse there is a bit of free play with a small addition that will serve as a visitor entry into the building. We are especially happy to partner with a Providence startup landscape architecture office, Sealand Design to make this an informed and cross disciplinary effort that improves the experience of the visitors to the site. More to come! The Atlantic Design Works complex consists of a mid 1800s Gasometer, and its early 20th century addition. The Atlantic-Delaine Gasworks, built between 1852 and 1864, consists of the 50ft diameter brick rotunda, which was used to hold flammable gas, as well as the adjacent 30ft x 140ft rectangular brick (retort) building, which would have housed the furnace used to heat the coal which released said gas. This illustration depicts a gas manufacturing plant of the 1920s. Still, the general process would be similar to the methods used in Olneyville in the 1860s—1880s. The gasworks was originally built at the same time as the second Atlantic Mill building, and would have provided for the lighting of artificial gas-lamps in the Atlantic Mill Building, as well to light local gas-lit street lamps. The second Atlantic Mill building was able to be twice as wide as the first Atlantic Mill (which relied solely on natural light) because of the availability of this new technology. The gas would not have been used to power the Atlantic Mill itself; the mill was a “steam mill”, originally using a coal-fired Corliss Steam Engine (rather than hydraulic power) to create power for its industrial machinery. Only in the late 1880s was hydraulic power incorporated, when the Atlantic Mill acquired the adjacent Union Mill. The Atlantic-Delaine Gasometer is one of three surviving gas plants in the city of Providence (one is located in the Elmwood section; the other is in the Wanskuck Historic District). The likely period of use of these buildings as a gas manufacturing plant was only about twenty years (1864-1884), after which the mill converted over to electric-arc lighting. The building originally would have had metallic domed roof, and would have had a capacity of about 27,000 cubic feet of gas. The dome was removed in the early 20th century and replaced with a lower-profile heavy-timber roof. After the Gasworks outlived its original purpose, it was converted to storage, and in the late 1940s to early 1950s the triangular building at the corner of Manton Ave and Aleppo Ave was built. This building was owned by Arpin Van Lines, a local moving and warehousing, company founded in 1900 which originally delivered ice and coal in the Providence area. The company is still head-quartered in Rhode Island, and now has an international reach, and is one of the top five moving services in the United States. Inside our Conference Room, one can still read the “ghost sign” that would have been painted on the exterior of the building, touting their five warehouses at that time! The building was used as office and warehousing space during this time, until the early 1980s. A vehicular scale was installed during this time period, the exterior concrete pad rests between the two gasworks buildings, and the original scale is inside the lower level of the triangular building. In the late 1950s to early 1960s the “connector” building between the Gasometer and the Triangular Building was added, and the square windows in the rotunda were punched in. These painted letters were uncovered during the demolition of the face of this wall, which was at one time an exterior facing wall between the circular and the triangular buildings. We decided to let these letters remain as they are. This 60 year old Rhode Island company is based across Aleppo Street, and used this building, as well as the Retort building as storage for their jewelry supply company. 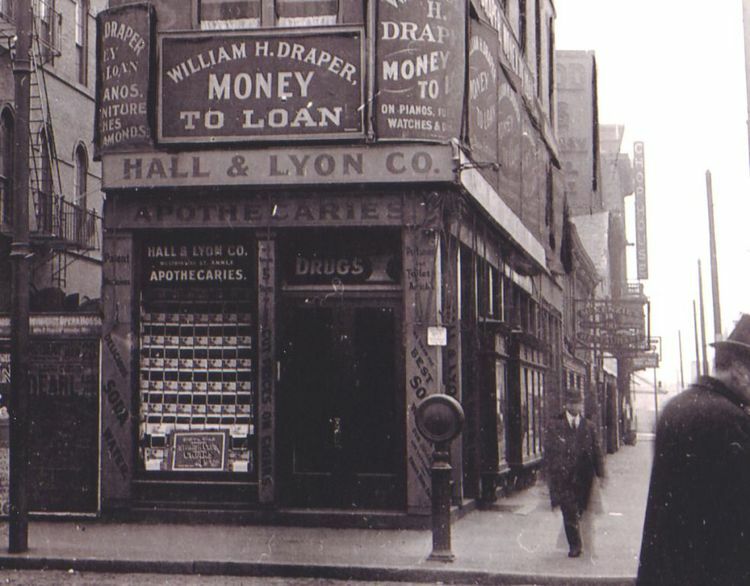 This ties in with the history of Providence as a “jewelry capital of the world”—as it was a manufacturing center from the 1800s through the mid 20th century. In the early 2000s a women’s arts collective acquired the building, with the goal of it serving as a center for arts-based programming. They acquired a grant from the State of Rhode Island Historic Preservation and Heritage Commission, which they used to restructure the roof—truncating four columns and creating the trussed ceiling which exists today. The group used the Triangle’s former bill-board as an opportunity to display public art. This public art bill board, installed by the Hive Art Collective, disappeared in a major wind storm as the buidlig was getting remodeled, but we plan on following the idea with another art installation in the future. When Studio MEJA purchased the building, it was an un-insulated, vacant shell, with non-functional or out-dated mechanical, electrical and plumbing systems. They have economically improved the building’s enclosure and systems, brought natural gas into the building (which it ironically was never supplied with), replaced the windows and added a common entrance stair from Aleppo Street. The space can now accommodate up to three separate tenants, and we hope it will continue the entrepreneurial and creative spirit the building has embodied over the last 150 years. This area, now exhibiting some of its historical signage, with new floors, finishes, fixtures, and treads now serves as the "lobby" and conference area into the Atlantic Designworks. Our First Ground up Project, an AAA in East Providence, is in the works, and the MEJA team got together to brain storm an elegant and striking design. Collectively we were able to push the scheme in an exciting direction while maintaining simplicity in form. The straight forward program, the sun, and the constant flow of traffic surrounding the site act as the guiding forces in shaping the exaggerated and recognizable building, easily read by pedestrian and vehicular traffic. We are planning to integrate eye-catching colors, textures, and graphics that help define the nature of the building as it sits quietly on a relatively open site. Our Open House and Christmas Party is almost here! Please join us at our newly renovated space, the historic 11 Aleppo in Olneyville. Come check out what we've been doing with the building and celebrate this holiday season with some delicious locally sourced treats and beverages. We hope to see you there! Find us on your Bike! We are super lucky. Our office is conveniently and beautifully located on the Woonasquatucket River Greenway, a bike ride that some of us take advantage of during our breaks, as well as our commute into work. The path is an integral part of the connective tissue of Olneyville: it allows people to traverse Olneyville without a car, provides a healthy and pleasant recreational environment, connects people with the natural features and habitats of Providence, and strengthens the community during the numerous Woonasquatucket River Greenway events hosted by the Woonasquatucket River Watershed Council. From the windows of our office we see kids on their bicycles and parents with strollers heading to the park, doubtless the existence of this path fills their life with peace and adventure. So put on your helmets and ride straight to our office! Taylor makes a (roughly) 3mile commute to the office from the East side. Our building also features the beautiful River Greenway to orient cyclists to the path. For the first time we are working on a free standing building, which means it's not an addition or a fit-out; it is a completely brand new, ground-up building! It will be just beside the East Providence AAA dispatch center we worked on as well -it is currently under construction. It's exciting to address this portion of the Wampanoag trail in East Providence so comprehensively and to be the creative directors and orchestrators of such a large site. We are letting the character of the dispatch center-to-be inspire the new free-standing building, emphasizing exaggerated awnings and a flat, elongated geometry. Electricity is on at our future office, Atlantic Design Works! The space is almost ready for us, just a few more finishing touches and some diligent dusting. The equipment is being installed at the company gym at Schneider Electric in Foxboro, MA! This former storage space will now give employees an opportunity for fitness on-site! A recent site visit to the historic Union Trust Bank building in downtown Providence revealed an original exterior sign from the early 1900s. Discovered during the demolition of the 12th floor, when the ceiling from the 1930s addition was removed. The photograph also highlights the drastic improvements of concrete as a building technology in the span of 30 years. Similar to the Rooftop at the G building next door, the building owner is investigating designs for a 12th story restaurant with rooftop. We came across these killer fixtures during some project research this week. Seriously considering designing a project around some of these guys!